There are five chocolates per box, and who knows what kind they'll be? This chocolate tastes like epicness, this one tastes like more characters, this one contains poetry and this one... Well, that one just has ganache in the center. 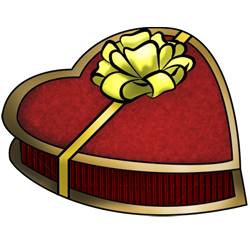 Give your valentine a surprising treat this year, and see what they bite into!